We were just at the Evergreen museum that hosts Howard Hughes' Spruce Goose (though he preferred to call it the Flying Boat). It's in McMinnville, Oregon, home of the News-Register, the paper for which I was a correspondent and photographer while I was in college. 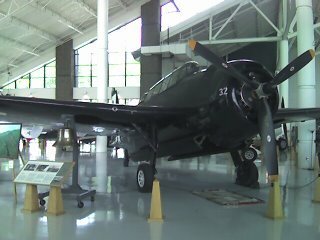 flew TBM N5260V (the plane pictured here) from El Mirage California to Chico. The total flight time was 4 hours including the flight test after installing a different engine. It caught on fire when we first started it, so we had to repair some cowling fasteners and wireing. Most of the side glass was gone and it was full of sand, so I needed goggles to see. Aero Union bought 3 TBMs and 1 PV-2 from a defunct company, probably Riverside Aircraft. Of the 3 TBMs I was the only one that made it non-stop. The others had to land for repairs.